Clip of the Day: Could You Survive as a Sea Turtle? A new video from TED-Ed showcases the life of a sea turtle, including what it takes to make it to adulthood. From a whopping thousand eggs laid in a nesting season, just 20 survive to breeding age—but in today’s environment, only two actually survive, because human interference has wiped out the rest. While there will probably be a few big-ticket items on your shopping list this year, there are still stockings to be stuffed, cousins to be appeased, and gifts to be exchanged at office gift parties. Here are a handful of sub-$30 gifts that’ll stand out a little more than an iTunes card. These aren’t your typical houseplants. 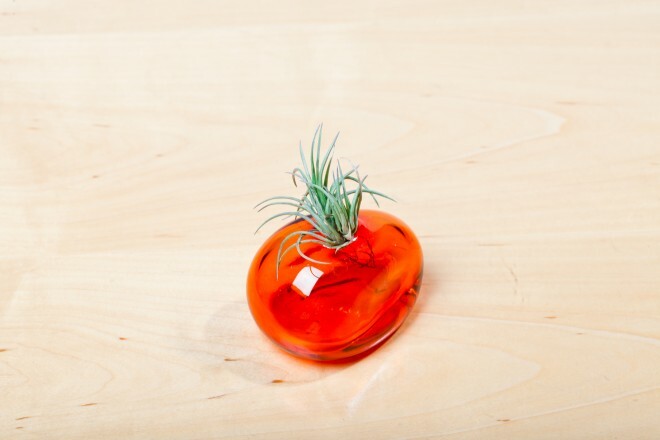 Tillandsia live inside glass balls with their roots exposed, not buried in dirt. They are also fairly hearty, even for people who seem to make houseplants wither at their touch. Give them plenty of light and a misting of water every few days and they’ll be happy. As they grow older, some species — of which there are over 500 — turn into beautiful colors. If you’re comfortable shipping a living thing, you can get five for $15 from Amazon. Etsy is a great source for specialty containers. It looks, like, well, a bomb, but underneath its facade is a useful tool. Pro photographers use the Rocket Air Blaster ($8) to clean their sensors and lenses. But it’s also great to blow a concentrated stream of air at anything that needs it. Your keyboard, your phone’s charging port, your cat. Even at your face, just for funsies. Even if you know nothing about the person whose name you pulled out of a Secret Santa hat, you can surmise they’ll be using a pen at some point. So Fisher’s $20 Bullet Space Pen works well as a gift for anybody. I love mine — it lives in my pocket anytime I’m out — and I would still love to get another as a gift. 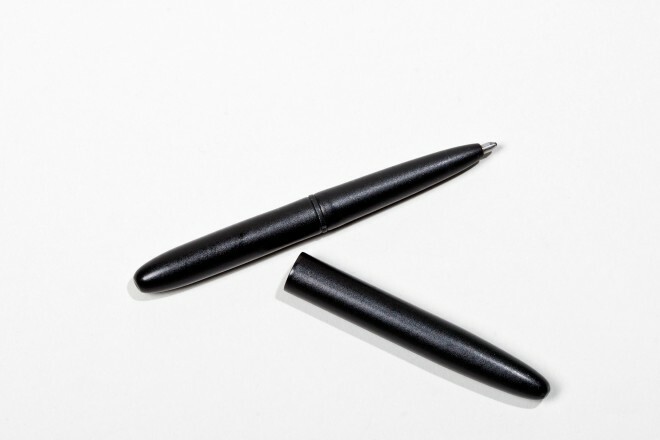 It’s about half the size of a regular pen with the cap on, but pull the cap off and stick it onto the back, and the pen becomes a full-sized, well-weighted writing utensil. The design was ingenious enough to earn a place in the Museum of Modern Art’s permanent collection. The pressurized cartridge lets you write upside down while laying in bed, and it works in zero gravity — hence the “Space” in the name. They’re still great tools on Earth, too. Even if everyone you know professes to like Keurig K-cups, that doesn’t mean they’re ready to shun the wonders of good coffee. The AeroPress ($28) is one of the most flexible single-cup coffee makers. It even has a thriving subculture built around hacking it to get the best possible cup. A paper airplane doesn’t make a good gift (although it can make a good GIF.) 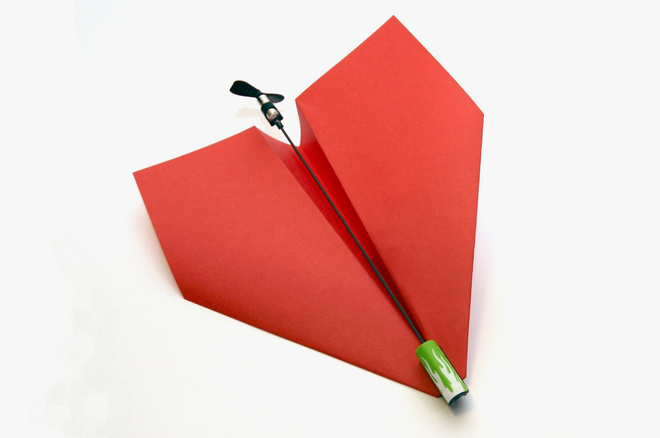 But a battery-powered paper airplane is the kind of toy any child, or child-at-heart, can love. Although this $20 kit includes an adapter for three AAA batteries attached to a propeller, it still clocks in at less than an ounce. So yeah, heavier than paper, but still light enough to fly. Don’t forget AAA batteries for gifting-day fun. Who doesn’t like Mario? If you can’t stretch your budget to gift a Wii U and Super Mario Bros 3D, these 3-inch tall cake toppers ($15) are pretty much the next best thing. 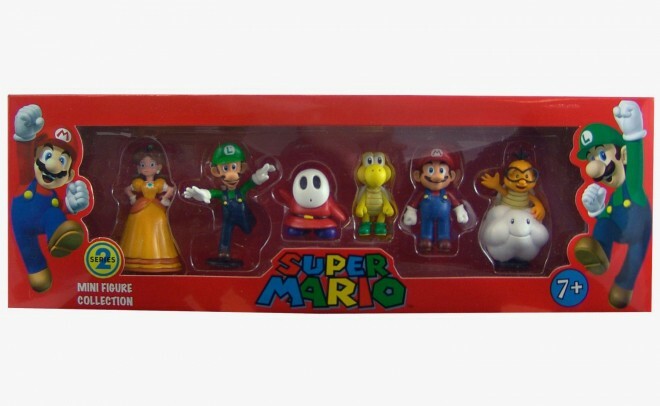 You get six figurines, including Mario and Luigi, for under a Jackson. Sure, there’s no motion control or 3D-effects. But with imagination and an afternoon, you can make your own world that’ll put the Mushroom Kingdom to shame. After the wrapping comes off, there’s often another layer of blister-packed, difficult-to-open packaging before you get to the gift itself. That’s why Zibra’s multitool ($10) makes a perfect gift aperitif. 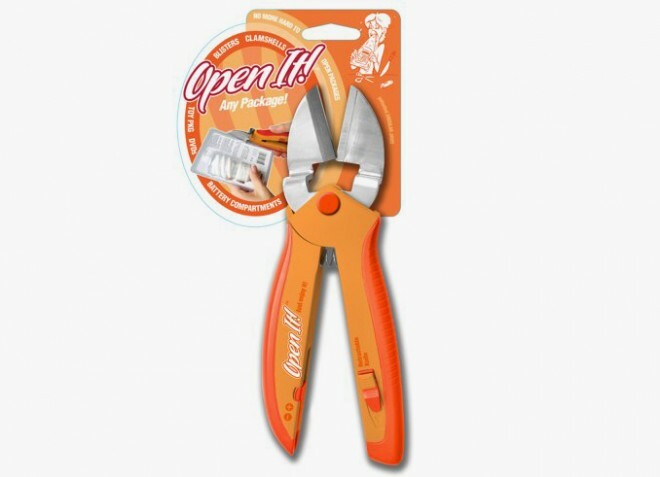 While the multitool is primarily a combination of wirecutters and a pair of scissors, it also includes also a utility blade for stripping away annoying shrink wrap, and a small screwdriver, in case some assembly is required. The demise of rare-earth magnet toys was greatly exaggerated. 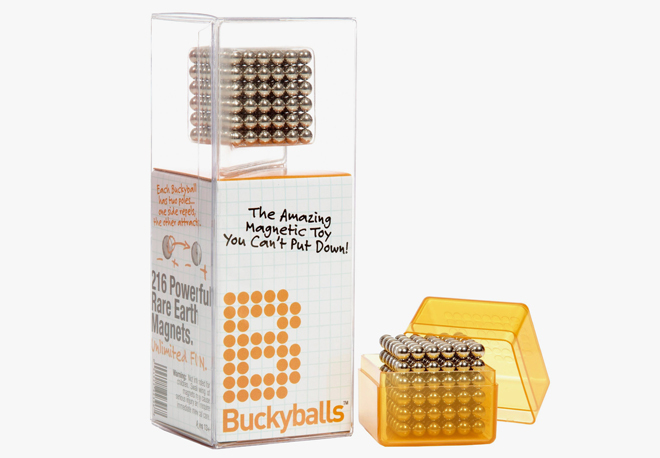 Although Buckyball itself can no longer market its magnets under the name “Buckyballs” (because some children found them delicious) there are competing brands and generics still legally available on the market for around $20. As in years past, they are addictive to play with and make a perfect geeky gift — even more so now they carry a whiff of contraband. Just please don’t put them in your mouth. While the Chemex Brewer remains out of the price range of most office gift exchanges, their new borosilicate glass mug makes a perfect design-y present. 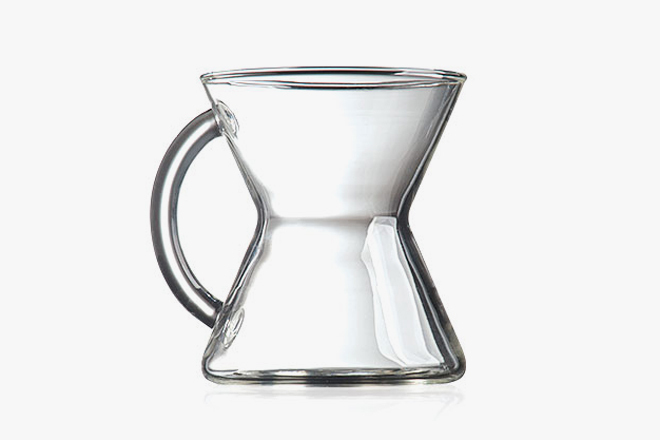 The Chemex glass mug ($16), although it is made of thin glass, can certainly take your coffee’s temperature. Plus, it looks like a cross between laboratory equipment and a nuclear cooling tower. And, hey, everyone needs a good mug. If a delicate glass mug isn’t geeky enough for your friends and family, here’s a mug with extra functionality beyond, y’know, looking nice and holding hot liquid. 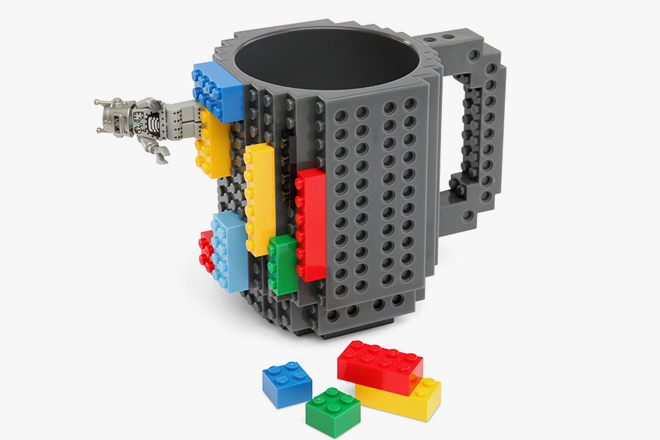 This $23 mug — which totally isn’t made by Lego — is not only perfect for your morning cup of coffee, but it can also attach to toy bricks. No toy bricks included, so you should totally throw in a few Minifigs. The problem with this gift is that the giftee might mistake it for a humdrum, cheap roll of duct tape. It is not. Gaffer’s tape is what duct tape wants to be when it grows up. It tears cleanly and bonds strongly, and it leaves no residue behind. It’s used in film and TV productions because it works. 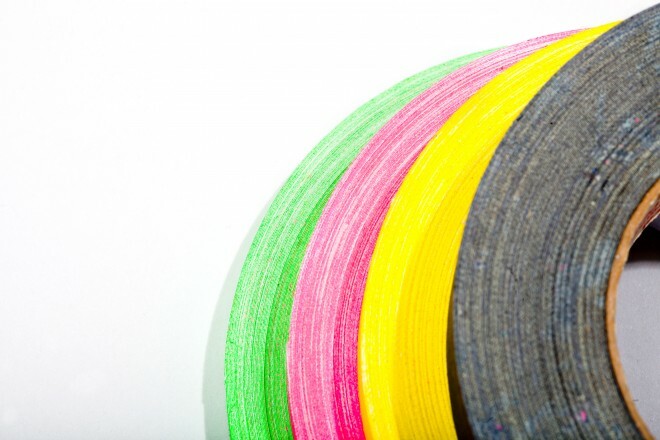 Everyone should be so lucky as to have a roll of gaffer’s tape. Gift a white roll and a couple permanent markers and it becomes a great way to label stuff. $20 earns you 30 yards. Here’s a gift that your giftee won’t see coming — probably because they didn’t know it existed. But they’ll love the concept behind Quirky’s Stem Metal and CitriTwist ($30), which is a fun set of juicer gadgets. 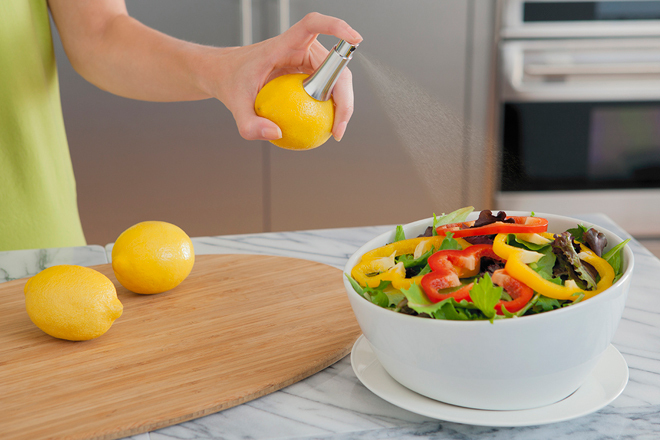 First is a pump that you jam into any piece of citrus fruit, turning it into a spritzer. The rind of the fruit becomes the bottle. It’s perfect for brightening up salads and fish. It comes bundled with a Quirky citrus reamer, which is a single-use utensil but is super-handy for making cocktails. You probably won’t be giving anyone lemons, because that’s crazy. But maybe you can gift them the tools to make lemonade. No matter your opinion on Satoshi Nakamoto’s crypto-currency, a chunk of one makes a better gift than unofficially naming a star. Currently, $30 nets you about three percent of a Bitcoin. Since Bitcoin is an online only currency — you can’t plunk a 2000 Satoshi bill into a red envelope — and your giftee probably doesn’t already have a wallet, use a Bitcoin voucher service for the physical gift. 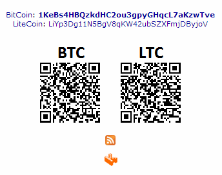 They look like a gift card and after scratching the back, the lucky recipient can load those Bitcoins onto a popular wallet like Blockchain.info. Sometimes it’s best not to overthink the problem, especially when the problem is what White Elephant gift to get your coworkers. 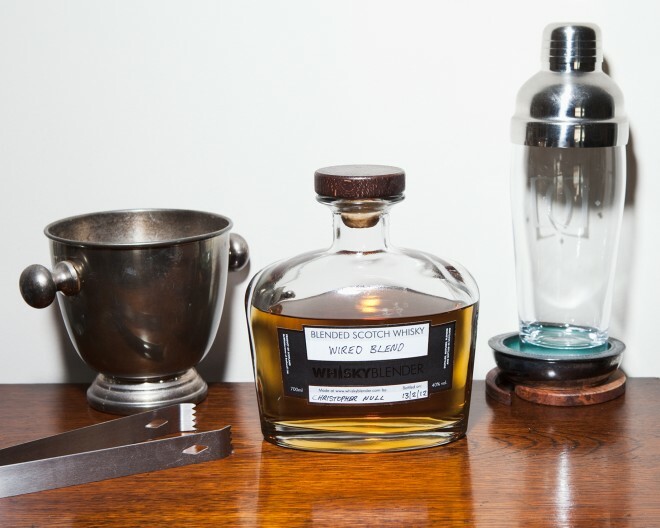 A bottle of good liquor looks great with a bow around it, and shows a little bit of personality with the selection. And I promise you there’s someone at the gift exchange who wants to bring it home. The plates55 forum is now active. The RIAA alerted the U.S. Government to several notorious pirate websites this week, including The Pirate Bay. While the inclusion of the infamous torrent site doesn’t come as a surprise, the RIAA did raise a novel issue. The music labels point out that The Pirate Bay has embraced the cryptocurrency Bitcoin, which they believe makes it harder to seize and trace the site’s funds. While the former is certainly true, a quick look at TPB’s Bitcoin wallet easily reveals where the donation money is being spent. This week the RIAA submitted a new list of “notorious websites” to the U.S. Government, sites that the labels would like to see disappear. The Pirate Bay also made it onto the list and the RIAA points out that despite the criminal convictions of its founders, the site continues to operate. The identities of the current administrators of the site remain a mystery to the music industry group. Interestingly, the RIAA also brings up the fact that The Pirate Bay is now accepting donations through the cryptocurrencies Bitcoin and Litecoin. This apparently complicates law enforcement efforts to track and seize funds of the torrent site. “In April 2013, the site started accepting donations from the public by Bitcoin, a digital currency, which operates using peer-to-peer technology,” RIAA notes. Bitcoin does indeed make it harder to seize funds, as law enforcement would need access to the computer where the wallet is kept. However, tracing where the Pirate Bay donations go isn’t all that hard. In fact, all transactions are visible to the public and we can today reveal where some of the Pirate Bay donations went. In total, TPB has raised close to 100 Bitcoins spread over two addresses, which is roughly $20,000 at the current exchange rate. 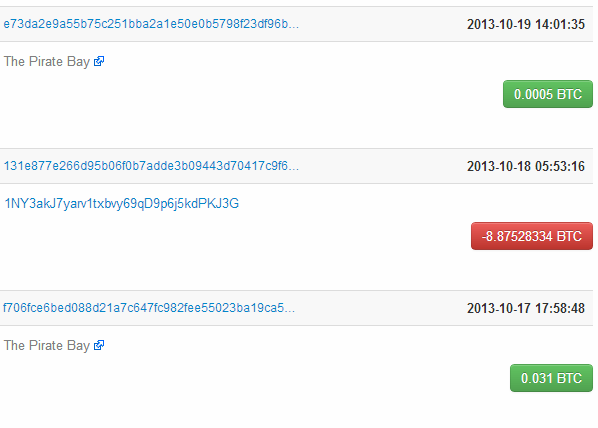 A quick look at the current wallet shows that The Pirate Bay received 64 Bitcoins which were all spent elsewhere. As can be seen below, most recently 8.97 Bitcoins were spent on a fundraiser for a public audit of the open source encryption software TrueCrypt. Before that, part of the donations were spent on a charity rally from Dover to Mongolia. Of course, Bitcoin addresses can also be used anonymously so it’s not always possible to identify or trace the recipients. 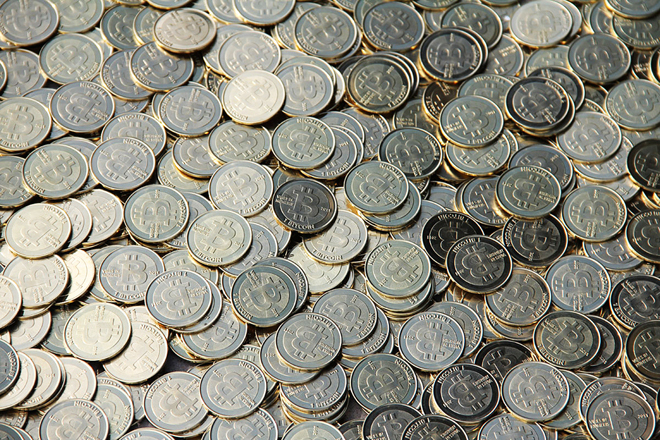 TorrentFreak talked to The Pirate Bay team who told us that they don’t manage the Bitcoin donations themselves. They are grouped into one fund with donations to other projects, such as the PublicBitTorrent tracker, and end up in a central fund that’s managed by someone from the Pirate Party. Considering the above, RIAA’s comments regarding the Bitcoin donations make it look much more suspicious than reality shows. But perhaps that’s exactly what the labels want to achieve? With all of the running apps available for smartphones to track your distance and pace you might ask yourself do you really need a separate running watch? While the power of free and minimal cost running apps such as RunKeeper, Daily Mile or Endomondo has grown over the past few years there are some distinct advantages to a dedicated GPS watch. The type of data recorded and what you can do with it is similar between both apps and GPS watches. Both options will provide you with core functionality of your current pace, distance traveled, elapsed time, a map of your route and other metrics to measure your performance over time. It is the actual functionality of the two options while running that makes a separate running watch the preferred choice. I recently conducted my own test of biking 5 miles with an iPhone 5, a Samsung Galaxy Nexus and the Garmin Forerunner 210 along with a CatEye Strata bike computer with a sensor on the wheel. I performed this test on my road bike instead of running so I could have an accurate control distance with the bike computer attached to the wheel so the actual ground covered was recorded. This is the same method used to issue USATF running race course certifications (wheel measurement). Only the Garmin matched the bike computer within a margin of .01 miles. The iPhone and Samsung Galaxy Nexus both over reported the distance traveled and pace substantially. For runs of a mile or two this may not be a big deal, but if you run longer distances over 10 miles the results can be running over a mile or more less than the phone has reported! That 20 mile marathon long run you might do could end up being more like 18.5 miles. What’s worse, your pace is being reported incorrectly. You will have a false sense of your performance capability and learn of this on race day when you run a measured course only to find your phone has betrayed you! In another test, I wore both my Garmin Forerunner 210 and used RunKeeper on my Samsung Galaxy Nexus during the 2012 Chicago Marathon. The phone was strapped to my upper arm with a clear view of the sky. Downtown Chicago presents tough challenges for GPS devices. The tall buildings can bounce signals or block them entirely causing measurements of your location several blocks away or zig zagging across the city. Extended underpasses such as the one at the beginning of the race block GPS entirely for nearly half a mile. I personally believe the Garmin recorded my actual distance covered due to any weaving or not running the exact course line over the course of the marathon. If there was any error due to the buildings or other obstructions it was minimal. The phone was not even close. There is nothing worse than finding out your pace is not what you think it is or how you trained on race day when you discover your phone has over reported all along. Reduced Accuracy The GPS sensors vary greatly between different phones. But the one thing that holds true today is they are less accurate than a dedicated GPS running watch that is specifically designed to capture precise movements. While this is reported universally among runners I wanted to see for myself. Phones are less accurate than a GPS watch for a variety of reasons. The most common reason is due to the compact form factor of a phone along with all of the other antennas and circuitry inside there just isn’t enough room to include a more accurate GPS sensor. In some phones, the type of sensor used might also vary, but that is beyond the scope of this discussion. 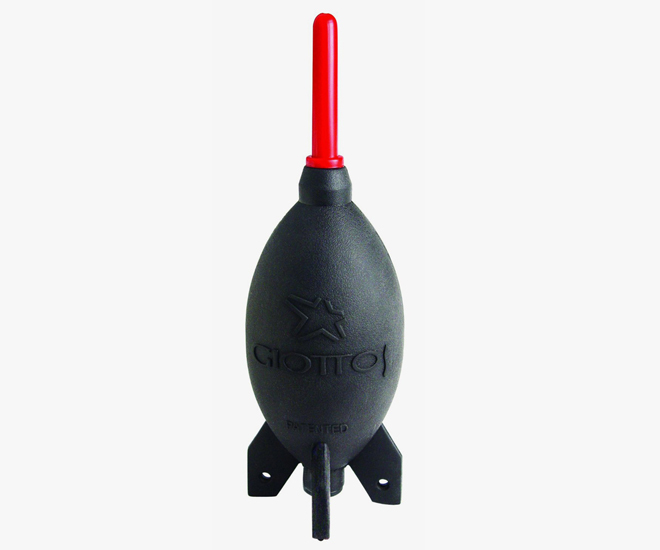 GPS watches have a larger GPS sensor as a critical component. For a phone, the GPS is designed to give a very good indication of your location, but not a pinpoint. Compounding the problem, phones do not take a continuous recording of your location but rather frequent “snapshots” in time. These data points are then connected by the shortest distance between the two points. This is why quick movements, turn arounds or tight turns are often cut off when reviewing phone GPS data on a running app. Finally, the algorithms used to calculate distance traveled also vary in phones. Phones are not designed specifically with accurate GPS distance measurement in mind the way a running watch is. A phone is a Swiss Army Knife. It can do a variety of things, but not all of them very well. Tracking Progress While Running A big issue with running applications is viewing your distance, pace, time elapsed and possibly heart rate while you are running. Typically your phone is strapped to your arm or on a waist belt out of easy sight. Running apps have tried to counter this shortfall by having computerized voices periodically announce your pace and splits over your earphones if you are listening to music. But what if you don’t listen to music? You will have to physically wake up the screen and make a concerted effort each time you want to check your progress. Even if you do listen to music I find the announced intervals are not often enough to stay on track if you are monitoring your pacing. A running watch is always within easy view without altering your running form and provides immediate feedback of your run. Pacing is easy to determine at a glance. It is always on and nothing to fiddle with. There is a reason a phone’s screen turns off while running which brings up the next issue. Battery Life Today’s smartphones can do a lot, but battery technology has not kept pace for their energy demands. A running app is not only constantly using the GPS of your phone, but also the data plan in order to update maps and sync data. Other features such as social network sharing or uploading to websites can use even more battery. I haven’t even mentioned the draw of the battery for that big screen and any other applications the phone is running either such as your music player and countless apps in the background. If you plan to run longer than 2-3 hours your phone may not make it through your run leaving you without a way to call for help if needed and leaving you flying blind for the rest of your run. Not good! GPS running watch batteries can reliably capture 8-10 hours or more of activity and can remain on standby over a week. In other words, more than you will need! Data Plans Use of a running app requires a data plan on your phone. With many carriers limiting data use or families sharing plans this can add up. While a running app may not consume a lot of data, it consumes more than a GPS running watch that uses no data plan! Indoor Use If you want to record your running on an indoor track or even a treadmill forget it with a smartphone. Your phone’s GPS will do you no good indoors. GPS watches are equally useless indoors, but many can be paired with an optional footpod that can record everything with a good degree of accuracy, except for plotting on a map where you ran. You simply keep on running! I’ve owned both Polar footpod devices and Garmin footpod devices and find the Garmin devices perform really well compared to Polar. Even better, for instances where GPS may be blocked (such as the half-mile underpass at the beginning of the Chicago marathon), a footpod serves as a secondary data source that is automatically tapped so you are never running blind waiting for the signal to return. Other runners will be in the dark. It is our recommendation that if you are serious about your running and want a tool best suited for the job it is a great decision to invest in a GPS running watch. If you are just starting out and want to get a feel for the type of data you can record about your runs you can start with an app and then transition to a watch later. Running apps are powerful but are just not accurate enough to be used to train reliably. This again is no fault of the app designers, but limitations of phone hardware. They also are inconvenient for measuring real time progress while you are running. The watch I personally train and race with, along with many elite marathoners such as Ryan Hall, is the Garmin Forerunner 210. In considering a running watch, there are a lot of features, functionality, styles and form factors to consider. I use the Garmin Forerunner 210 as it has just the information I need and enough functionality to train effectively. It can be enticing to have a running watch with more bells and whistles but in the end it is just different ways of reporting the same data. All you really need is distance, time elapsed, pace and possibly heart rate and cadence if you use those to train. When you get home you can easily upload all of the data and analyze your run and progress while recovering! NASA’s Voyager 1 spacecraft has gone interstellar. Launched in 1977, the probe is vintage space hardware. At more than 36 years old, or roughly a millennium in computer years, it’s an impressive feat to have the spacecraft drifting through the material between stars. Looking at the machine’s specs is a reminder of how far electronics have come in the intervening years. “Here on the ground, we keep up with the latest technology,” said engineer Suzanne Dodd, the Voyager project manager at JPL, with most of the science team using Mac power books these days. She recalled when she started working with the mission in 1984, they were using then-state-of-the-art desktop computers with 8-inch floppy drives. But Voyager 1 and 2 are from an even earlier era and, being 19 billion kilometers away, “you can’t take them into the shop and upgrade them,” said Dodd. The computers aboard the Voyager probes each have 69.63 kilobytes of memory, total. That’s about enough to store one average internet jpeg file. The probes’ scientific data is encoded on old-fashioned digital 8-track tape machines rather than whatever solid state drive your high-end laptop is currently using. Once it’s been transmitted to Earth, the spacecraft have to write over old data in order to have enough room for new observations. The Voyager machines are capable of executing about 81,000 instructions per second. The smart phone that is likely sitting in your pocket is probably about 7,500 times faster than that. They transmit their data back to Earth at 160 bits per second. A slow dial-up connection can deliver at least 20,000 bits per second. The Voyager probes are always sending out a signal. Voyager 1 has a 22.4-Watt transmitter – something equivalent to a refrigerator light bulb – but by the time its beacon reaches us, the power has been reduced to roughly 0.1 billion-billionth of a Watt. NASA has to use its largest antenna, a 70-meter dish, or combine two 34-meter antennas, just to hear Voyager. The science team communicates with Voyager 1 and 2 every day and typically needs at least four hours just to run through all their health and safety checks. On a good day, researchers might spend double that time sending commands and receiving data. The spacecrafts’ original control and analysis software was written in Fortran 5 (later ported to Fortran 77). 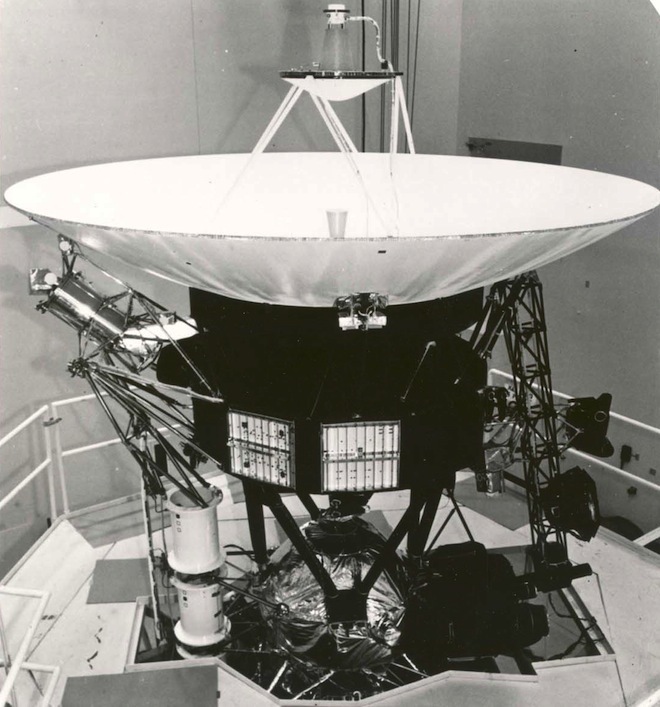 Some of the software is still in Fortran, though other pieces have now been ported to the somewhat more modern C.
Part of the Voyager probes’ longevity comes from the fact that they were robustly built and included plenty of redundant components. Even having two machines to accomplish the same task is something that NASA doesn’t do much of these days (Imagine if we had two Curiosity rovers on Mars). Practically all of Voyager’s redundancy is gone now, either because something broke along the way or it was turned off to conserve power. Of the 11 original instruments on Voyager 1, only five remain operational: the UV spectrometer, the magnetometer, a charged particle detector, a cosmic ray detector, and the plasma wave system. But as the hardware ages, more and more things can break. “We’re always one failure away from losing the mission,” said Dodd. Still, the Voyager probes have far exceeded expectations. Looking at engineers’ testimonials from when it was built, Dodd said the original designers were told not to worry about reaching interstellar space and focus on making sure the Voyagers could observe Jupiter and Saturn. “Basically they kind of ignored those directions, nodded their heads and did what they wanted to make it capable of getting to interstellar space,” she said. As long as they are still functioning, both Voyager spacecraft will continue to collect data and send it back to us through at least 2020, and possibly until 2025. Even if something breaks and they are suddenly unable to hear anything from Earth, they will keep sending data back, repeating the same sets of observations until they run out of power. But the radioisotope batteries on Voyager 1 and 2 are diminishing, putting out four Watts less per year. Mission managers will one day have to prioritize which instruments are most important during the voyage through interstellar space, shutting them off one by one as the years go on. After that, both probes will remain within range of our antennas until perhaps 2036. Though scientific data won’t be returned, engineering data could still come back if there is enough power to send a signal. All this means that the mission isn’t yet done. Check out this video that compares the boot speed of the iPhone 5 vs. iPhone 5c vs. iPhone 5s. All three iPhones were freshly restored to iOS 7.0 with absolutely no data or accounts set up on the device. The counter was started from the exact moment each device received USB signal and stopped as soon as the lockscreen was loaded. Take a look below and please follow iClarified on Twitter, Facebook, Google+, or RSS for more news, tutorials, and videos! Updated: Microsoft confirms 17 October as Windows 8.1 release date. Microsoft has made the Windows 8.1 consumer and enterprise previews officially available to download, and the final editions are expected to ship around the one-year anniversary of the Windows 8 launch. The software giant has confirmed that Windows 8.1 will be launched at 4am PDT (12 noon GMT) on the 17 October and will be available through the Windows Store as a free download. Microsoft also confirmed that new devices running Windows 8.1 will go on sale beginning on18 October. MSDN and TechNet subscribers are not expected to get early access to the upgraded OS, reports ZDNet. An near-final version of Windows 8.1 dubbed (9471 build) has leaked online, providing some insight into the changes Microsoft has made. This will include revamped Mail app, more context sensitive menus and help and tips app. on your Surface Pro device.